The SV650 engine really sounds mean once you open up the exhaust! The Suzuki SV 650 is well known for its untapped performance potential and its fun factor at track days. Now, Yoshimura has a high-performance system that makes the SV come to life. Our endeavor to make power for the SV started off with our Alpha T muffler profile, and we added head pipes to increase power where the SV needs and can use it the most. 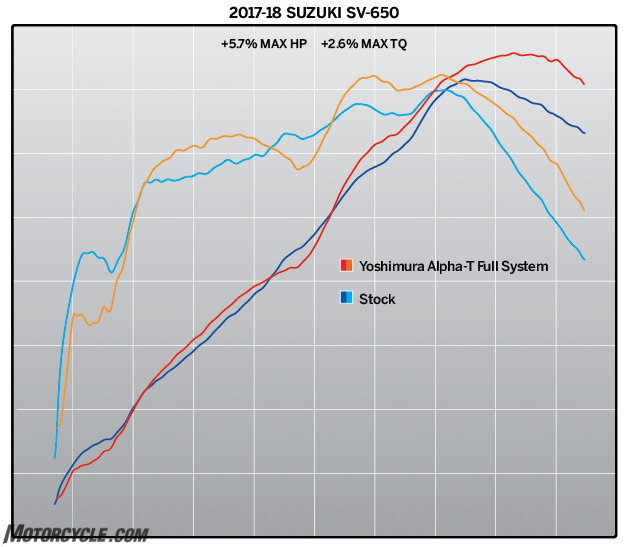 Torque is what the SV is known for and we even increased that! All wrapped up with the now famous Works Finish, the newest gen SV is ready to head to the race track! Our new system reduces weight over the sock system by over 8 pounds! This is the system you need to race the SV 650. Note: This full system utilizes the stock rear header primary. Stock Full system weight:17.6 Lbs. Yoshimura Alpha T full system weight:9.4 Lbs. The post Yoshimura Introduces 2017-18 Suzuki SV 650 Race Series System appeared first on Motorcycle.com News.